Earthwatch partner Kraft Foods is the world’s second-largest food company, and is actively engaged in employee learning, community investment, and environmental research initiatives with Earthwatch. Kraft Foods is the world’s second-largest food company, with annual revenues of nearly $50 billion, reaching consumers in about 170 countries. Kraft Foods owns iconic and well-known brands such as Cadbury, Jacobs, Maxwell House, Milka, Nabisco, Philadelphia, and Trident, many of which are more than 100 years old. Kraft Foods acquired Cadbury—a long-term partner of Earthwatch— in February 2010. The second-largest food manufacturer in the world. Raising awareness among local communities and visitors of the need for sustainable cocoa production and livelihoods. Following five years of support for the Earthwatch Mexican Puma project, Cadbury and Earthwatch launched the Earthshare program in December 2004. This was the start of a partnership among key stakeholders interested in cocoa farming in Ghana: Earthwatch, Cadbury staff and business units, early-career Ghanaian scientists, researchers, local communities in Ghana, universities, and NGOs. The Earthshare program is a fine example of a successful business–NGO partnership, engaging individuals from both Cadbury businesses and local communities in scientific research to investigate key issues around biodiversity and cocoa productivity in cocoa-growing regions of Ghana. From 2005 to 2009, the program focused on scientific research to inform strategies to increase understanding and promote action for sustainable cocoa production in Ghana. It led to a better scientific understanding of cocoa sustainability issues, an ecotourism initiative at the project site in eastern Ghana, and the engagement of over 100 Cadbury stakeholders in scientific field research and associated personal development activities. Cadbury and Earthwatch have worked together since 2005 to offer employees the opportunity to participate in the Cocoa Farming and Biodiversity in Ghana project. Cadbury employees worked with local scientists to assist with data collection and learned about cocoa-farming practices, rural livelihoods, and ethical sourcing. Through this program, Earthwatch helped staff consider their own role in adopting more environmentally friendly ways of working in order to help drive positive change in their workplace. Following their two weeks in the field, employees contributed to initiatives of Cadbury’s environmental management team. 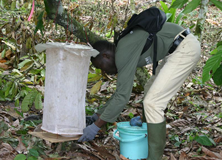 During the partnership, 30 young scientists were selected to participate in the project by our Ghanaian NGO partner, the Nature Conservancy and Research Council (NCRC), based upon their potential to become the conservationists of the future. Many of them reported life-changing outcomes from their experience, and one young scientist joined the Earthwatch research team as a member of staff. Cadbury funds supported construction of a visitor center in the village of Adjeikrom and development of environmental interpretation material for the local community. Through the program, NCRC collaborated with the local community to develop a tourism development plan, targeting audiences ranging from the local research community to foreign visitors. New ecotourism initiatives were launched at Bonsu, Abompe, and Adjeikrom, which have generated interest from tour companies and international universities wanting to use their facilities as field school locations. Since 2005, Cadbury has been working in partnership with Earthwatch to implement a sustainable cocoa and biodiversity research project in Ghana. In the first three years, the project studied cocoa production and biodiversity on farms in and around the community of Adjeikrom in eastern Ghana. 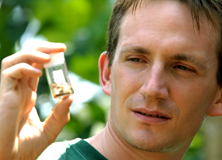 During the fourth year (2008), the research focused on adding to valuable data sets on cocoa productivity. This project contributed to the development of a major new Cocoa Partnership in Ghana. Recommendations from the research have been incorporated into a new curriculum that is being developed by the Cocoa Research Institute of Ghana for training extension agents to support sustainable cocoa production throughout Ghana. The project also developed a cocoa ecotourism initiative to help diversify the economy in cocoa-growing areas and raise awareness among local communities and visitors of the need for sustainable cocoa production and livelihoods. 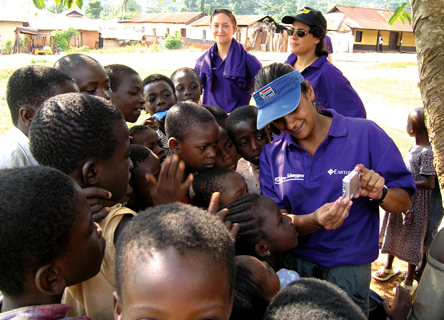 Cadbury employees worked with local scientists to assist with data collection,they also learned about cocoa-farming practices, rural livelihoods, and ethical sourcing.